Northern Exposure is located in Nantucket near town center on Lower Orange Street just beyond West Creek Road, nine-tenths of a mile from Main Street. Four bedrooms, two full baths, and one-half bath. Eight-adult person maximum. First bedroom - king-size, second bedroom - full-size, third bedroom - twins, and fourth bedroom - twins. Sundeck and off-street parking. Only Full Week Rentals from Sunday to Sunday - end of June until early September. Memorial day weekend is available as a part of a full week rental only. Daily Rates available for Off-Season Rentals with a 3 Night Minimum. Rentals made prior to January 15 require an initial payment of 1/3 of the total rental amount within 7 days of booking plus the refundable security deposit. (Security deposit is 10% of the total rental amount or $400 for weekly). 1/3 of total rental is due April 15. The remainder of rent is due no less than 30 days prior to arrival date. Rentals made after January 15: One-half of total rental amount is due within seven days of booking, plus the refundable security deposit. Security deposit is 10% of the total monthly rental amount or $400 minimum for weekly. The remainder of rent to be received no less than 30 days prior to arrival date. Rentals made within 30 days of arrival date: The total rental amount and security deposit (payable by Visa, MasterCard, American Express, Discover, PayPal bank transfer, or PayPal balance transfer) including a signed lease must be received prior to arrival. These policies are for renters from the US only. There will be different payment requirements and lease terms for all non-US Lessees. There is no cancellation provision in our lease agreement. If an emergency precludes use, we will make best effort to re-rent at the same rate and, if successful, the renter will receive a refund, less a cancellation fee of 10 percent of the gross rental. If the period cannot be re-rented, the entire rent shall be payable and forfeited. My office is located near the historic city of Charleston in Mount Pleasant, SC. 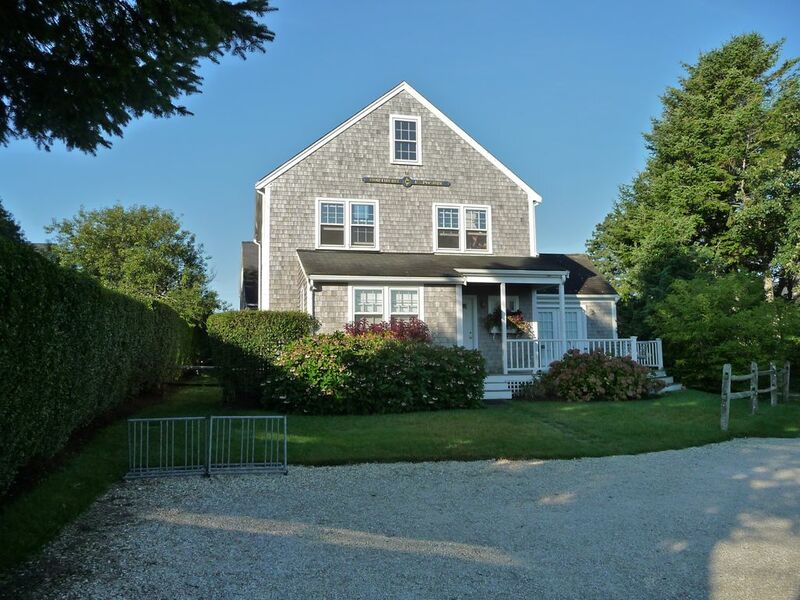 Conveniently located near bike paths, grocery store, fish market, restaurants, banking/ATM, downtown Nantucket and beaches. Window units throughout the house. All bath towels, wash cloths, hand towels, beach towels, sheets, pillowcases, and comforters provided. 46" and 55" High Def TVs Comcast HD TV service with many Premium Channels and 2 Standard Def TVs with Comcast TV service. With mini cable to connect phone or iPod. Everything was there to make our vacation easy and stress-free and perfect. We highly recommend this property. This was a great house. The location is great. You can walk to town in about 15 minutes. The best part is you only blocks from the stop and shop, the best coffee, best pizza, and much more which is great when you have little kids with you. The house was super clean. Nicely furnished. Would definitely rent it again. Me and my girlfriends had the most perfect long weekend at this beautiful home. The house is gorgeous. It was spotless when we arrived and all appeared to be very recently updated. The location is great. It was a short walk to town, and very easy access to a grocery store and restaurants. I would highly recommend staying here. Roland was kind and informative. We look forward to coming back to Nantucket! Great house for 8 people!! My family & I rented this house for a week in June. There were 8 of us and we all fit very comfortably. There was a great big room for all of us to sit around that was connected to the large kitchen. The shuttle stop to different places was on the road of the house. We walked into town which was less than a mile. Working with the owner, Roland, was wonderful. Talked with him a few times prior to our visit. While we were there I had a question and left a message; he called me back right way so I was very happy about that. I would highly recommend renting this house! Thanks again, Roland! The week of July 23-30, 2017 is available at the reduced rate of $4,500. Refundable security deposit is 10% of the total rental amount or $500 minimum.